It may not look like it based on the small selection of titles below, but this is a great week for Blu-ray fans. Not only does it mark the debut of Joss Whedon’s awesome Marvel superhero team-up movie, but Fox is releasing “Bond 50,” a box set containing all 22 James Bond films in celebration of the franchise’s 50th anniversary. And if that’s not enough to get you excited, there are a few other titles worth checking out as well. Not many people would have been willing to wager before the start of the summer season that “The Avengers” would emerge as the year’s best superhero film, but Marvel’s big gamble proved everyone wrong. In addition to making beaucoup bucks at the box office (earning a spot as the third highest grossing movie of all-time), it was also better than “The Dark Knight Rises” and “The Amazing Spider-Man.” Director Joss Whedon deserves a lot of credit for not only balancing the film’s many tones, but the large cast as well, and although some actors fare better than others (namely Robert Downey Jr. and Mark Ruffalo), the ensemble works together so well that you’d think it was part of the plan all along. And in that respect, the movie’s real MVP is Marvel Studios head honcho Kevin Feige, the brains behind the cinematic tapestry known as Phase One, which is comprised of everything leading up to and including “The Avengers.” But more than anything else, the film is just a really entertaining superhero flick that deserves a place in anyone’s collection. 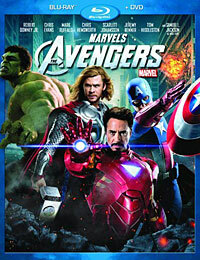 Blu-ray Highlight: Disney didn’t provide me a review copy, but there’s plenty of bonus material that I’m looking forward to checking out, including the director commentary by the always amusing Joss Whedon and the newest Marvel short film, “Item 47,” which supposedly played like gangbusters for the crowd at this year’s San Diego Comic-Con. 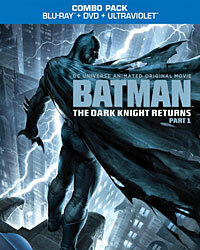 After the release of “Batman: Year One,” it was only inevitable that Warner Bros. would follow it up with an animated version of Frank Miller’s other popular Batman story, “The Dark Knight Returns,” even going so far as to split the four-issue miniseries into two movies. Though the forthcoming Part Two will no doubt be the better of the pair as it features the return of The Joker, Part One is still a really solid adaptation that sticks close to the source material while also laying the groundwork for the darker and more twisted second half of the story. The idea of revisiting Bruce Wayne/Batman decades after he’s passed his crime-fighting prime (as well as introducing yet another Robin, this time female) provides so many great character moments that it’s surprising Hollywood hasn’t tried adapting the series into a live-action film. Though bits from Millar’s comic have shown up in Christopher Nolan’s Bat trilogy, it’s cool that Warner Bros. found another way to showcase the fan favorite story, even if that meant doing it in animated form. Blu-ray Highlight: The bonus material isn’t very good, but those that can’t wait for Part Two will at least want to check out the included sneak peek, which offers your first look at Michael Emerson in action as The Joker and Mark Valley as Clark Kent/Superman. Though I’ve never been a very big fan of the horror genre, there was so much positive buzz heading in to the first season of “American Horror Story” that it was simply too enticing to pass up. But despite a somewhat creepy pilot, there was never anything particularly scary about the show apart from its opening credit sequence, and believe it or not, that’s the least of its problems. Between the melodramatic, soap opera-like subplots, the nonsensical twists, and the habit of certain stories and characters falling by the wayside, “American Horror Story” is such a muddled mess of half-baked ideas that it’s never able to achieve the potential of its intriguing setup. Connie Britton at least makes some of those shortcomings worth suffering through, and if there’s anyone in the cast that deserves praise, it’s Britton and not Jessica Lange’s over-the-top performance as the duplicitous nosey neighbor. In the end, however, it’s probably best that creator Ryan Murphy decided to essentially reboot the show every season with a brand new story, because after 13 episodes of this much crazy, it’s hard to imagine many viewers sticking around for another helping. Blu-ray Highlight: A review copy didn’t arrive in time, but the audio commentary by Ryan Murphy on the pilot episode should be worth listening to if you’re a fan of the series.